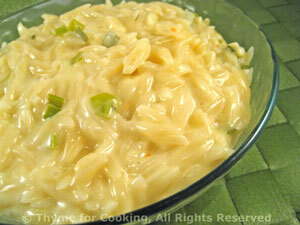 Shrimp in Green Sauce with creamy Orzo, quick, easy gourmet dinner. 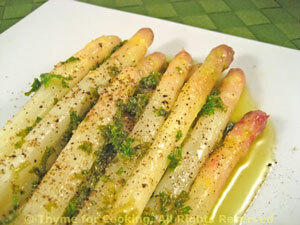 White or green asparagus is simply finished with a light Lemon Parsley vinaigrette. If white use vegetable peeler and peel the bottom half of stalk, laying it flat on the counter so as not to break it. Lower heat and cook just until done, 6 - 8 minutes, a bit longer for white. Whisk together olive oil, lemon juice and parsley. 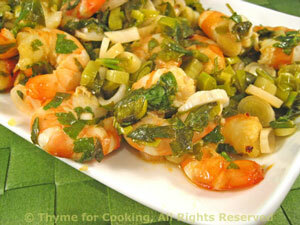 When asparagus is done, drain and put onto a serving plate, drizzle with Vinaigrette, add pepper and serve.